Dian Pelangi, Norma Hauri, and Monika Jufry will be among 250 modest fashion designers to showcase their new collections at the first Muslim Fashion Festival in Jakarta between May 25-29. Held by the Muslim Fashion Festival Indonesia (MUFFEST), and Indonesian Fashion Camber (IFC) the fashion festival will feature designers from Malaysia, Turkey, Italy, Russia, United Arab Emirates and Bangladesh. 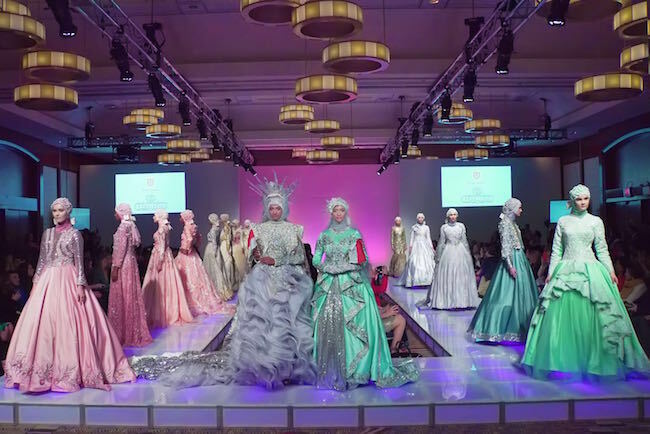 “The Muslim fashion festival is organized by Indonesian women entrepreneurs to empower Muslim women to take part at the billion dollar fashion industry,” Said Wijayanto, director Indonesian Trade Promotion Center in Chicago. Today, according to the 2015-16 State of the Global Islamic Economy Report Muslim consumers spend an estimated $230bn on clothing, and footwear a number that is projected to grow to $327bn by 2019 – larger than the current combined clothing markets of the UK ($107bn), Germany ($99bn) and India ($96bn). Luxury brands such as Dolce & Gabbana have released Modest fashion wear aiming at Muslim consumers. High street stores like Zara and DKNY have releasing Ramadan or Eid collections in countries with large Muslim population. Indonesia consider the fifth biggest market for Muslim fashion, after Turkey, United Arab Emirates, Nigeria and Saudi Arabia. Less than 10 days ago, Modes fashion industry had a fashion week in Istanbul. It seems Indonesia, as a Southeast Asian country, doesn’t want to lose to Turkey, a Middle Eastern nation.